Residents moving into a new social housing development in Boston will have the added peace of mind that their homes have been built to a new flood resistant design. 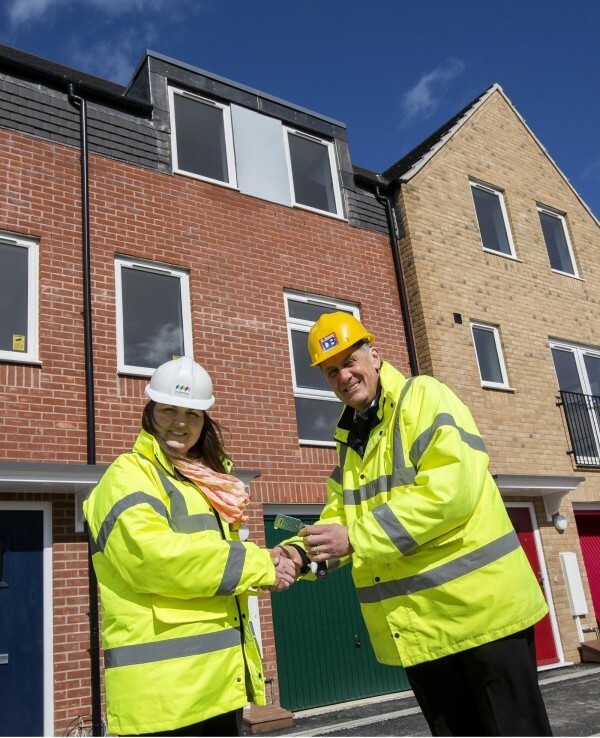 Keys to the first phase of a new kind of innovative flood resistant housing in Boston have been handed over by building firm D. Brown Building Contractors Ltd. The homes are designed specifically for high risk flood areas and so have no living accommodation on the ground floor. They are among the first of their kind to be built since flooding affected Boston and other east coast areas in December 2013. The Blue Street development for the Waterloo Housing Trust will comprise of 41 homes when fully complete at the end of this year. The terraced and semi-detached homes are either two or three storey and eight are for shared ownership and the remainder for rent. Under the contract, Moulton Seas End-based D. Brown has been responsible for design and build of the development along with associated vehicle access, services, hard standing and landscaped areas. Peter Pitt, Senior Contracts Manager for the firm, says the homes are built with timber frames and to Level 3 Code for Sustainable Homes. “With staggered, pitched roofing, Juliet balconies and garages with doors and metal gates the development looks very attractive compared to many social housing schemes,” he said. “Importantly we have designed the homes to have no living space on the ground floor due to the flooding issues associated with Boston and the surrounding low-lying area. “This is the biggest housing site we have undertaken to date – we started in July 2014 and needed to have first phase complete for the end of March,” he added. D. Brown specialises in residential and commercial construction, building maintenance and refurbishment, contracting, regeneration work and heritage building restoration throughout East Anglia and the East Midlands.